It has long been speculated that the source of the damaging DNC leaks was the murdered DNC staffer Seth Rich. His family recently hired a private investigator and that investigator is saying that Rich was in contact with WikiLeaks before he was shot dead. Nearly a year after the unexplained slaying of a Democratic National Committee staffer, a private investigator hired by the victim’s family says he has some key information. Staffer Seth Rich’s violent death prompted several conspiracy theories considering his political ties and according to Rod Wheeler, there’s at least some certainty on if Rich was communicating with WikiLeaks. “Absolutely. Yeah. That’s confirmed,” the former D.C. detective and Fox News contributor told FOX 5 according to information he supposedly has from unnamed sources. The Jew media has been claiming that all the leaked material from the DNC was part of a Russian conspiracy. There’s been no proof that the Russians were behind it. It was always more likely that the material came from a disgruntled person inside the organization. After all, they skewed their entire nomination process in favor of Hillary Clinton when the grassroots was behind Bernie Sanders. That obviously was going to piss some people off. So it makes much more sense that this material came from someone inside versus the Russians. WikiLeaks has also stated on the record that the DNC leaks did not come from a Russian source. With this new information, it appears as if Rich was in fact the source of the DNC material that WikiLeaks published. It is also safe to assume that his murder was linked to this. So is the Jew media finally going to stop pushing this lie about the Russians being this? Probably not! This entry was posted in Assassinations and tagged Assassination, Bernie Sanders, Censorship, Conspiracy, Democratic National Committee, DNC, Hillary Clinton, Jullian Assange, Leaks, Media Control, NY Daily News, Rod Wheeler, Russians, Seth Rich, Social Unrest, Washington D.C., wikileaks. Bookmark the permalink. The Jews don’t mind killing people. Cross ’em and find out. John F. Kennedy was going to end the Federal Reserve…..DEAD! They were wanting to send a message to the goy sheeple. Message received!!! Our government is not controlled by the citizens at the voting booth. Israel is in total control. False flags are the rule. Make war by deception. The investigator needs to keep digging. Rich’ death has the hallmarks of a Clinton-ordered hit all over it. Shouldn’t be too hard to connect the dots to this, and all the other sudden deaths / ‘suicides’ / disappearances by those who crossed Bill & Hill. the murder victims , he’s allegedly killing??? [ Editor’s Note: One has to ask, as usual, “why now” with what is really an old retread story, based on “evidence” that this “new” State Department report clearly states as conditional with its “probably a crematorium” comment below. The State Dept. is smart enough to know this is a weak story, but ran with it anyway, knowing it would get good media play, and it has. Human Rights Watch, another long-time controlled front organization, also jumps on stories like this with its “war crimes” headline grabber, despite the generalities they use, which would not even get a grand jury indictment, much less a conviction. 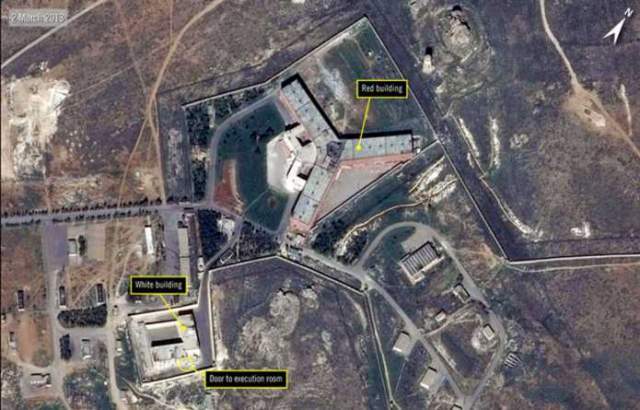 There is another issue missing in the story analysis, the little item that Syria clearly has the right, under international law, to execute large numbers of prisoners if it wanted to. In this particular case, it would involve having military trials for all foreign jihadi terrorists captured in the field, where they were convicted on terrorism charges and sentenced to death. You know it was the jews for Killery.. The Doctor that took care of him has come out to say that he was fine after surgery was in his room when ‘The Man’ showed up and they pushed all people off the FLOOR and then somehow killed him …. Is the doctor next? Netanyahu does not care what the world says and really does not care what we say either. They have enough Jewish politicians placed in key positions in America that they can cause havoc and change opinions. Remember since Israel was made a nation Jews all over the world now have a safe place to return to no mater what they have done. If they ruin the US with immigration and black criminals……..,who cares.? If they get really afraid that America has found them out or it looks like they are about to go to jail,….they can go straight to Israel for safety. What other politician can do that quickly with no questions asked? Most Hebrew politician either have duel citizenship with Israel or can get it easily. I know that there are normal Jews who do not get involved with all of these political games but a whole lot of them do and when they do they seem totally opposite in their thinking than good middle-class Americans. Excuse me but I cannot get all fired up over a group of people who invented Marxism (karl Marx was a jew). The Jews are getting unpopular in a lot of countries because of their leftism agenda. I do not hate all Jews. That would be stupid. I do believe their politicians are bad for America. Yes. The jews can wreak havoc in every country on earth and get away with it scot-free by fleeing to Israel. The zionist state has always been reluctant and stubborn when other countries wanted to prosecute jewish criminals or former communist mass murderers like Salomon “Shlomo” Morel. If a country(in this case Poland) complains, the jews immediately play the anitsemitism card and refuse to extradite the criminal. After the 2014 jewish maidan coup d’état, the Ukraine has become the poorest country in Europe. Of course all poor/middle class jews struggling to make ends meet were allowed to make “Aliyah” ie. migrating to Israel. Same with the current situation in (((socialist)))-wrecked Venezuela, where many ordinary people have resorted to eating dogs, cats, or rats in order to survive. It has become so bad now, people are starving to death. The rich jews play golf and count shekels in their secure “compounds”, while that dystopian shithole goes to hell in a hand basket. And as Europe gets flooded with millions of hostile muslims and savage africans victimizing Whites on a daily basis, jews leave Europe in droves. “Useful Idiots” ie. American and European taxpayers foot the bill for this crap, no matter if they like it or not. The indigenous Palestinians get replaced and ethnically cleansed in the process. This agenda is pure, unadulterated evil and has been meticulously planned by the jews for decades.